Camden County College’s dental hygiene and dental assisting students and staff – joined by area dentists – will provide free cleanings, other preventive care and oral health education to area children aged 12 and younger for Give-Kids-a-Smile Day on Friday, February 1st. 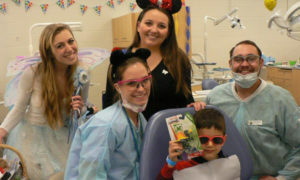 Give-Kids-a-Smile Day is a national event that has been held on the first Friday in February for more than 15 years. It is intended for children with little or no dental insurance, and its aim is to provide a day of dental care to youngsters who would otherwise not have access to these services. Each child will be given an oral exam and offered services such as cleanings, x-rays, dental hygiene education, fluoride treatments, restorations and simple extractions. Gentle dental care will be provided by volunteer dentists, dental hygienists, dental assistants, Camden County College staff and students of the dental programs. The “Tooth Fairy” will offer attendees support, prizes, toothbrushes, toothpaste and a friendly smile.